There’s an old saying. ‘If you always do what you’ve always done you’ll always get what you always got’. It’s rubbish! If you always do what you’ve always done you’ll be left behind in the dark ages. Things change in 25 years! I recently celebrated 25 years running my business and the landscape has changed enormously since 1992. When I started few of us had home computers or mobile phones so if we needed someone in a hurry we called their landline and sent documents by fax. The internet was in its infancy and email was still a few years off and when it did come in we could only share documents with those people who operated the same software as us because the pdf hadn’t been invented yet. When I bought my first computer it operated with Lotus Notes, a brilliant programme, much better than Microsoft in my opinion. However Microsoft were better at the marketing and won the lion’s share of the market. Sadly when I bought my second computer I had to go for Microsoft just because it was the only way to communicate with clients. Lotus struggled because it didn’t anticipate the market. Think about other companies that have bitten the dust or fallen on hard times because they didn’t adapt with the times: Kodak which failed to react to the advances of the digital camera; Blockbuster which didn’t see the threat or opportunity of Netflix; Nokia which used to be the leading mobile phone brand or Blackberry which was the business mobile phone many of us aspired to. More recently ToysRUs, Maplin and Jaeger have gone into administration, we’ve already lost Woolworths, BHS, Austin Reed and others too numerous to list. It’s very easy for us to get sucked in to working in our businesses and delivering for clients. We put our heads down beavering away building our businesses doing what we do because that’s what people want to buy. Today. Meanwhile there are all sorts of things going on around us. Where are the threats and opportunities? Do you remember what happened on January 27th 2010? That was the day that Steve Jobs launched the iPad and many journalists were quick to say that Apple had got it wrong this time. How wrong they were. The iPad and iPhone have spawned a whole industry for apps developers and created opportunities that forward thinkers and risk takers have been able to take advantage of as well as generating multi billions in revenue for Apple. The iPad left competitors playing catch up but is the iPad itself now being overtaken by a new generation of laptops that combine the benefits of the laptop and the tablet? My background is retail. I well remember the excitement as collaborations between the major retailers to develop out of town mega stores were announced. But some of those developments never happened and some of the supermarket chains have mothballed their hypermarkets even before they opened because our buying habits have changed. Now we want our big orders delivered and we want to pop into a local convenience store for our top up shops. Visiting stores has become a leisure activity but we do more of our buying online. So the threats and opportunities come from all sorts of different angles. Britain voted to leave the EU, what effect will that have on our businesses? There are businesses already blaming the decision for their failure. What would happen to your business if there was a change of government with new policies and maybe changes in taxation? And the economy is the next external influence. It can have a huge impact on our businesses. If people have less money in their pockets then their priorities change and they may no longer choose to spend as much money, if any with us. In 25 years plus I’ve experienced the opportunities and threats of changes in the economy. There was a time when a dip in the economy meant that government, both local and national, would throw money at business support and my business benefitted. I would win contracts covering several months, even years. I knew what those contracts were worth and how much work was required to deliver them. That gave my business certainty and me a degree of security. In recent years public money has been pulled away from business support and businesses have been expected to pay for any help that they’ve wanted. That’s had a significant impact on businesses like mine. No longer did we pitch for a contract to deliver services to hundreds of businesses at a time but we have to go after each one individually. Whilst government departments and local authorities often paid slowly we could be secure in the knowledge it would be paid, now we join the queue of people waiting on a small business’ cashflow to settle our accounts. We have to spend more resources on marketing although that is somewhat compensated by a reduction in administration. I’ve already touched on social when I talked about the change in buying habits. People have changed since 1992. When I started if you had a health problem you went to the doctor, there was very little in the way of complementary medicine or alternative therapies. If you wanted to learn something new you signed up for a training course or adult education, you didn’t watch endless free webinars and sign up for online programmes. And if anyone had talked about manifesting what you want to happen you would have been laughed at! If we wanted to get social we would arrange to meet friends in the pub or pick up the landline for a chat. We didn’t have a plethora of social media giving us 24/7 connectivity with a global audience. But will we get fed up with this in the years to come? I’ve also talked about technology and the business opportunities created by the Internet and the iPad to mention just two. I believe that we all have to embrace technology and to be open to the possibilities that it can bring to our businesses. And technology isn’t just about computers. I read recently about a development in smart bandages coming out of a British university. Within the very near future a bandage will be able to tell a medic how a wound is healing, remotely. There will be no need for the post-surgery patient to go back to a clinic to have the wound checked, the bandage will send a message to the doctor who will be able to make a judgment of what needs to happen next without even seeing the patient! Do you know what developments might impact your business? The chances are that Brexit will lead to some significant changes to UK legislation at least in time. What impact will that have on our businesses? I’m old enough to remember the introduction of the Health and Safety at Work Act. It made a massive difference to the way businesses operated but it also generated business opportunities in consultancy and for safety equipment suppliers. The raft of employment regulations has kept HR consultants and lawyers busy for years. What opportunities and threats might be created by legislation in the future? There are plenty of people promoting services on the back of the GDPR regulations. And the final E of PESTLE is Environment. It’s not many years since we were being incentivised to buy diesel cars as it was thought they were better for the environment. We have become much more knowledgeable about our environment and how the way we run our businesses and live our lives impacts it. Not only will there be changes in legislation caused by environmental concerns but people’s attitudes and habits will continue to change too. Could this have an impact on your business? 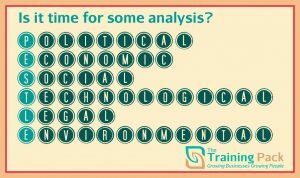 Is it time to do your own PESTLE analysis? 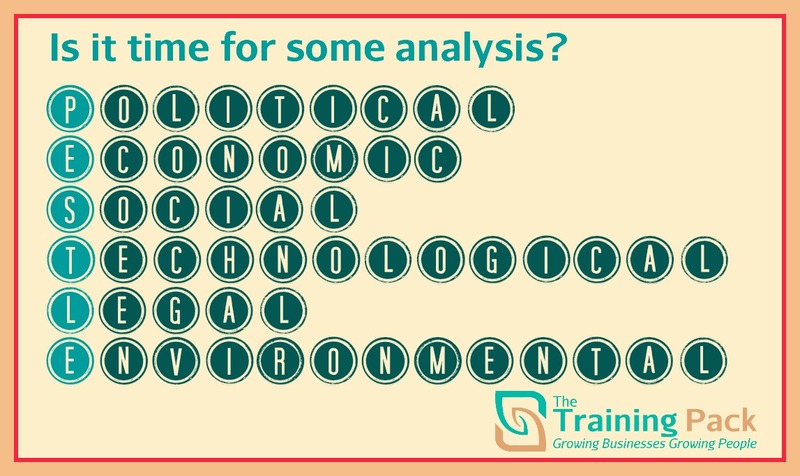 When did you last do your PESTLE analysis? Is it time for a review? If so I have a worksheet that should help you. Join my Facebook group here to access your FREE copy, you’ll find it in files.